Strangles is a respiratory infection caused by bacteria called Streptococcus equi subspecies equi (referred to a S. equi). Infections are routinely found in the upper airways and lymph nodes of the head and neck. 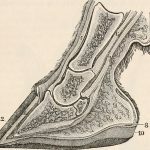 The most commonly affected lymph nodes are the submandibular (under the jaw) and retropharyngeal nodes (located between poll and throatlatch), and infections of the retropharyngeal nodes may erupt into the guttural pouches, where the infection can hide and spread even from a seemingly healthy horse. the aforementioned lymph nodes. The bacteria are spread via nasal secretions and drainage from abscesses. This can either be via direct, nose to nose contact, or via a human carrier. Due to the ease with which the Strep equi bacterium is spread, biosecurity plays a predominant role in stopping and preventing the spread of infection. When monitoring your horse for strangles, an increase in rectal temperature is by far one of the most important indicators of infection. The normal rectal temperature of a horse is 99.5-101.5◦F. Temperatures should be obtained twice a day during an outbreak. No new horses should be allowed on the property during an outbreak and no horses should leave a quarantined property during an outbreak. Quarantine is lifted two weeks after resolution of clinical signs of the last strangles case. Maintain separate, designated tools and clothing for healthy and infected horses. Do not cross contaminate. Strep equi can exist in water for up to one month. Water troughs or buckets used for infected horses should be cleaned and disinfected daily. 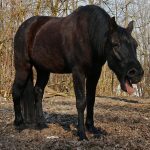 Manure from infected horses should be disposed of separately from healthy horses to prevent cross contamination of human or material fomites. 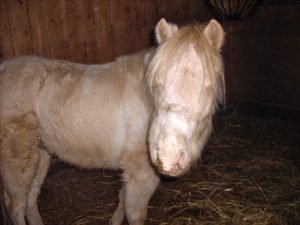 Strep equi cannot survive for more than 4 weeks on a pasture. As such, pastures housing infected horses should be rested for a month prior to allowing healthy horses to graze upon it. All sick horses should be tested via nasopharyngeal washes prior to being reintroduced to healthy horses. Three, negative washes is sufficient evidence for safe reintroduction. Should You Vaccinate for Strangles? During an outbreak, clients routinely inquire about vaccination for strangles. Dr. Baird and I feel that the risks associated with vaccination are grater than the disease process itself. Strangles is rarely life threatening and is merely an inconvenient upper respiratory infection. Most uncomplicated cases clear on their own without veterinary intervention or the use of antibiotics. Use of antibiotics in strangles cases, especially in young horses, precludes them from developing an adequate immunity to the Strep equi bacteria and makes them more susceptible to future reinfection. 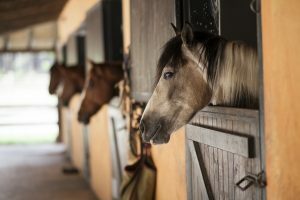 An exception to the vaccination rule is young horses headed off to training in a high-density boarding situation with poor hygiene and inadequate biosecurity protocols. Here, vaccination may not prevent the onset of disease but may lessen the severity of clinical signs. Overall, it is important to keep in mind that spread of this highly contagious disease can indeed be prevented via strict biosecurity protocols. In addition, we do NOT vaccinate normal, healthy horses for strangles in most situations, nor do we vaccinate them in the face of a current outbreak. Additional information on the Strep equi bacteria can be found on the American Association of Equine Practitioner’s website.